What hits the spot better than espresso or cappuccino with pumpkin biscotti cookies in the fall to warm you up? I would say not much if your a fan of both! Here is a perfect quick afternoon pick me up. 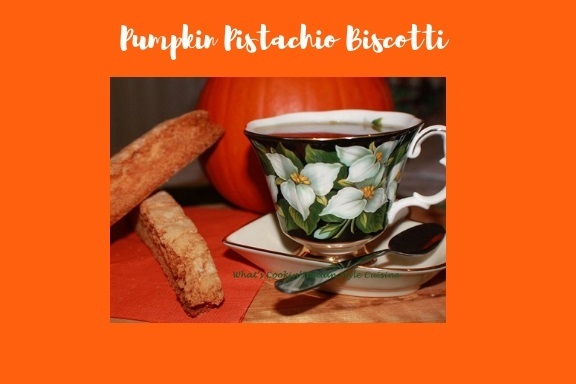 Sometimes when you need to celebrate the beautiful fall colors setting in and Holiday creeping up this will get you motivated to start planning those special flavors that shout fall, these are it! Pumpkins, flavored coffees, pretty colorful leaves changing and before you know it the Holiday baking begins. Try this flavor you will be pleasantly surprised especially when dunked in coffee. This is the perfect fall cookie when pumpkins are out in the markets. I love the smell of pumpkin spice while baking, it's so comforting. 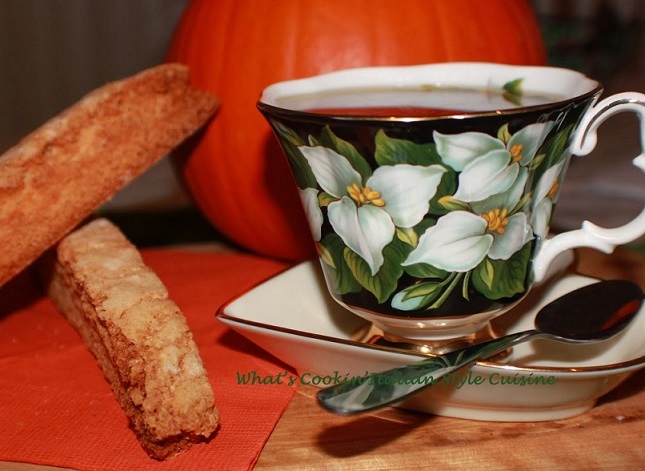 These pumpkin biscotti cookies are easy to make and can be made ahead of time for the holiday and put in the freezer. The keep fresh in the freezer for at least 6 months. 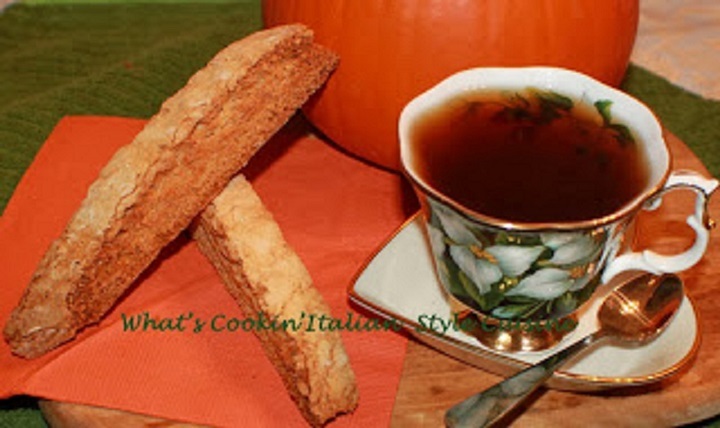 I love these old fashioned Italian biscotti cookies with pumpkin in them. During the holiday we like to take the pumpkin pistachio biscotti and dip each end in chocolate then sprinkle pistachios on the chocolate. The chocolate and pumpkin go very well together and the cookies are nice treat for Christmas. I always love to make them special during the holiday baking time. 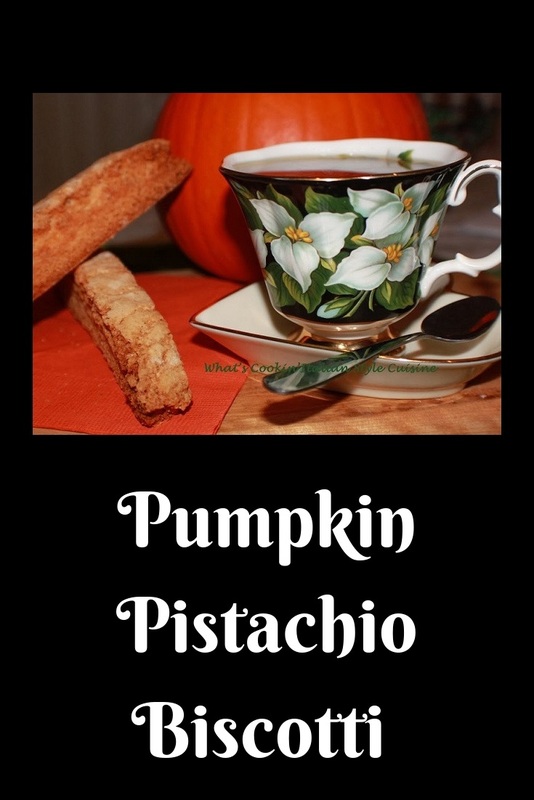 Pumpkin pistachio cookies are an all time favorite here. Get a large cookie sheet ready with either parchment paper or silpat mat works great! In a medium skillet sauté the pistachios in butter or olive oil. In a large electric mixer bowl, add all the dry ingredients. Place the mixer on stir and add in the eggs, puree until the dough comes together. If the dough will not form because of dryness depending on altitudes then add 1 tablespoon of milk at a time to the dough until is holds together perfectly. Add in the nuts. Mold two long shaped logs onto the cookie sheet around 2 inch x 10 inch long. Wet your hands to shape if you have problems holding the dough together. I find the mixer to do a great job getting the dough to form. Drop oven temperature to 350. Brush tops with egg, sprinkle with sugar and bake until lightly browned around 30 minutes. Cool slightly, place on a cutting board and cut them on a slant. Place back on the cookie sheet and lower the oven to 325, toast them until brown on both sides turning once.